Nina won her choice of $200 gift certificate with Bluewater Photo or Bluewater Travel! 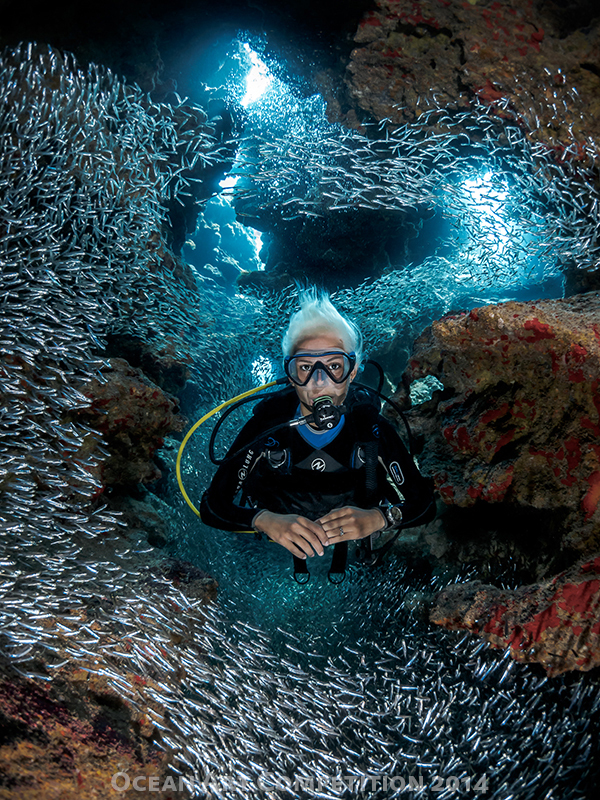 The story: For a few weeks a year, the Silversides appear in vast amounts in and around the grottoes, docks, and reefs of Cayman. As part of diver and good friend Gemma Smith’s professional portfolio, we headed to where the seasonal Silversides had gathered, knowing the potential for uniquely entrancing images. As a team, we concentrated on creating an image that would show off the diver, Silversides, and surrounding cavernous walls to full effect. The resulting photograph is meant to showcase the diver in harmony with the underwater realm and ocean life. Camera: Olympus OM-D E-M5, Nauticam housing, Panasonic 8mm fisheye lens, dual UFL-2 strobes.